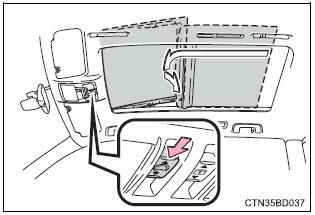 Use the overhead switches to operate the panoramic moon roof. *: to stop operation partway, quickly slide and release the switch again. 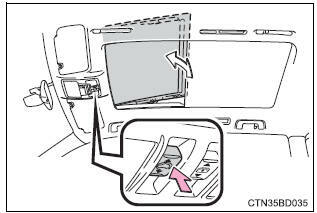 If the moon roof is open, pressing the switch closes it up to the tilt-up position. If the shade is closed past the half-open position when the switch is pressed, it will open up to the half-open position. The moon roof can be tilted down only when it is in the tilt-up position. *: To stop operation partway, lightly press the switch again. The moon roof stops slightly before the fully open position to reduce wind noise and the shade opens fully. Slide the switch again to fully open the moon roof. The moon roof can also be opened from the tilt-up position. The moon roof stops at the tiltup position. Slide and hold the switch again to fully close the moon roof. The shade and moon roof can be operated for approximately 45 seconds after the engine switch is turned to accessory mode or turned off. It cannot, however, be operated once either front door is opened. Slide the shade switch forward. The shade closes up to its half-closed position and then the moon roof closes up to the tilt-up position. Slide and hold the shade switch again. The moon roof closes as long as the switch is being held. After the moon roof is fully closed, the shade will fully close automatically. if an object is detected between the shade and the roof frame while the shade is closing, the shade stops and then opens slightly. if an object is detected between the moon roof and the roof frame while the moon roof is closing or tilting down, the moon roof stops and then opens slightly. At this time, if the shade is closed past the half-open position, it may also open slightly. Slide the moon roof switch forward and hold it. * The moon roof will close then reopen and pause for approximately 10 seconds. Then it will close up to the tilt-up position. Release the switch and then slide it forward and hold it again. The moon roof will close as long as the switch is being held. Slide the moon roof switch forward and hold it. * The moon roof will tilt down then tilt up and pause for approximately 10 seconds. Then it will close. *: If the switch is released at the incorrect time, the procedure will have to be performed again from the beginning. Slide the shade switch forward and hold it. * The shade will close then reopen and pause for approximately10 seconds. Check to make sure that the shade is completely closed and then release the switch. If the shade continues to close but then reopens slightly even after performing the above procedure correctly, have the vehicle inspected by your toyota dealer. The buzzer sounds and a message is shown on the multi-information display in the instrument cluster when the engine switch is turned off and the driver�s door is opened with the moon roof open. check to make sure that all passengers do not have any part of their body in a position where it could be caught when the shade is being operated. Do not allow children to operate the shade. Closing a shade on someone can cause death or serious injury. The driver is responsible for instructing children not to operate the shade. 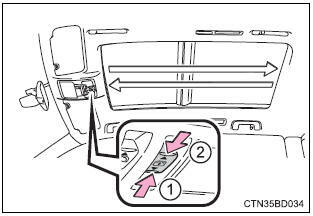 check to make sure that all passengers do not have any part of their body in a position where it could be caught when the moon roof is being operated. 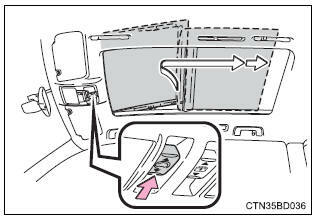 The jam protection function may not work if something gets caught just before the shade or moon roof is fully closed. before opening, make sure that there are no foreign objects such as stones or ice around the opening. Do not hit the face or edge of the moon roof with hard objects.